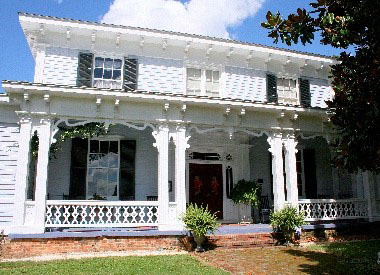 Warrenton Quilt Days will host a sparkling event Saturday night, April 16th, when we present our Gala and Reverse Raffle at Magnolia Manor Plantation Bed and Breakfast. The gala will begin at 6 p.m. with a unique and decadent menu provided by David�s of Roanoke Rapids. Participants in the event have an opportunity to win a grand prize of $5,000, as well as numerous prizes for every 25th number drawn during the lively reverse raffle. A maximum of 250 tickets will be sold. Each ticket costs $100 and provides one entry into the grand prize raffle and entry for two people into the gala. For a complete list of the rules, see the information below. 2016 - Warrenton Quilt Days, Inc. Cost per ticket is $100. Each raffle ticket provides one entry into the grand prize raffle and a catered dinner for two people. Tickets will be on sale from 7:30 am, February 15, 2016 to 5:30 pm, April 16, 2016, unless all 250 tickets are sold before the end date. A ticket is considered purchased when ticket is acquired and payment recorded by a staff of Warrenton Quilt Days or member of the Warrenton Rotary Club. All checks collected will be made payable to Warrenton Quilt Days, Inc.
A person must be 21 years of age or older to purchase a Reverse Raffle ticket and attend gala. All tickets will be drawn from the tumble basket. The last ticket drawn will be declared the winner of the grand prize of $5,000. Interval drawings will be held throughout the evening. Interval drawings will be awarded to the 1st, 25th, 50th, 75th, 100th, 125th, 150th, 175th, 200th, and 225th tickets drawn. If the Raffle Committee receives more interval drawing prizes than number of tickets listed here, those additional prizes will be drawn at random at the decision of the event manager. When ten tickets are left in the tumbler, those ten ticket-holders will be asked to come forward and will have the option to auction off their ticket to anyone at the event. The ticket-holder must establish the initial offering price and upon openly selling their ticket the holder must donate ten percent (10%) of the proceeds to the Warrenton Quilt Days, Inc. Each of the last tenticket- holders have one chance to auction off their raffle ticket at any time during the last ten pulls of the reverse raffle. When the last five ticket-holders remain, they will be given the opportunity to choose between splitting the $5,000 grand prize at $1,000 apiece or to continue to the raffle. The choice to split the grand prize must be unanimous. If any of the last five ticket-holders disagrees with splitting the grand prize, the raffle will continue. The final ticket-holders can choose to split the grand prize at any point after only five tickets remain, splitting the grand prize evenly. Should one of the last five ticket-holders not be present, the raffle will continue until there is only one winner of the grand prize. Businesses, companies, and non-profit organizations may purchase a ticket or several people may share the cost of a ticket. One person must be named as the ticket-holder. The ticketholder�s name will appear on the ticket stub recorded by staff of Warrenton Quilt Days, or a Warrenton Rotary member. The ticket-holder will be responsible for sharing any awarded prizes with those who shared the ticket. Neither the Warrenton Quilt Days staff nor the Warrenton Rotary Club will divide any prize with those sharing the cost of one ticket. Anyone sharing the cost of the ticket should note that each ticket provides one entry into the raffle and catered dinner for two people, no matter the number of people sharing the cost of the ticket.--- i.e., a ticket may be split by five people, however only two people will be provided with a catered meal for that one ticket. Should one of the final ten tickets be a shared-cost ticket, the decision to auction off said ticket will be left to the discretion of the named ticket-holder. Ticket-holder has the responsibility of dividing the money awarded from any auction sale among its shared contributors, after giving ten percent (10%) donation to the Warrenton Quilt Days, Inc.
Should one of the final five tickets be a shared cost ticket, the decision to split the grand prize will be left to the discretion of the named ticket-holder. Ticket-holder has the responsibility of dividing any money awarded from the total or split grand prize among its shared contributors. Winners are solely responsible for any and all taxes due on awards. Warrenton Quilt Days, Inc. complies with all IRS reporting. In the event that a rule dispute requires interpretation, Susan E. Harris, CEO of Warrenton Quilt Days, Inc. will rule.